This looks very promising. I'm excited to see what the future has in store. Fingers crossed. Here's hoping it does better than the Wii U. But I'm optimistic. I have a good feeling it will do better than the Wii U. From what I understand, a lot of the Wii U's failings came from its pricing (mostly due to the cost of the GamePad) and its name, which suggested that it was just an expansion to the Wii. We don't have to worry about the name thing, and hopefully the Switch, being its own single package (unless the dock is costly), will be cheaper than the Wii U. Also, the Wii U didn't have a lot of third-party support. The Switch does. Let's hope the third party support actually sticks. Many of them could jump ship for all we know. Now I could get behind a Lost Kingdoms III. ...probably gonna get hit for that one. I think this could be great. Hope it shows Nintendo learned from the Wii U's mistakes, but man it's a shame that system bit the dust. I was hoping it would pull a complete 180 and get some quality games without 'Zelda' in the title. 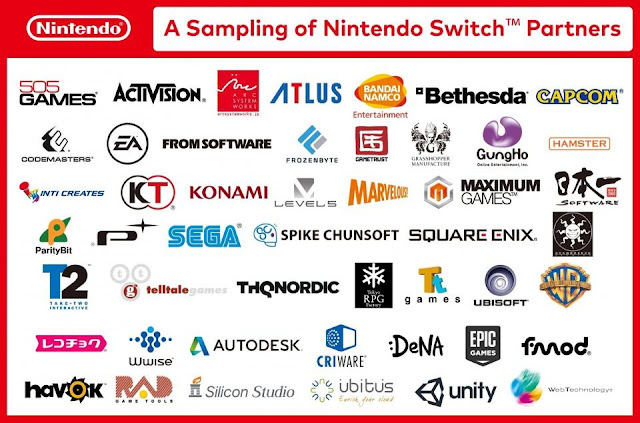 I wonder if this may set Nintendo back since the PS5 and XB2 (or whatever it's called) get announced and release, they'll have to make another system, but it may not be that far off at this point. Still, what was shown is a great idea. It's definitely building on the Wii U's good ideas and seems to be trimming a few less then stellar ones. But I want to see specs, and see where it goes. Along with how true that third party support is. Ubisoft was perhaps the biggest supporter of the Wii U on release, and then they just dropped it. This trailer was more or less meant to convey the idea across. It can be played on the TV, and you can take it with you anywhere. Bam. Done. Didn't want to overcomplicate things, I'd imagine. There is another even coming January 12th that will answer some questions, including specs and price. Personally, I wanna know what the battery life is. Yeah same, I hated the Wii U's pitiful battery life. And how if you wanted something better, you had to buy a battery and install it yourself. I could not bring myself to buy one of those batteries, it's basically like 'I'm literally paying for a really stupid mistake on Nintendo's part. That's not ok.'. I usually sit close to a power strip or outlet so I can just grab the cord and plug it in. -The Switch will launch March 3rd, 2017. -The MSRP will be $299.99 USD. -There is a revamped online service that will have a paid subscription this time. When the console launches, it'll be free, but the payment plan will be put into effect in the Fall. The online service makes use of smart devices to connect with friends and schedule play times and voice chat. -Region-locking is GONE! The Switch is Region Free. -The Joy-Cons have gyro controls. -The Right Joy-Con has an IR sensor, which can scan amiibo and also register objects such as your hand. -The new HD Rumble feature has more adaptive rumble capabilities. One example is being able to feel ice cubes sliding around in a glass, and how much "lighter" the controller feels when you empty it. -The L and R buttons on the Joy-Cons connect directly to the console/grip. -There is a share button. At first, you can only take screenshots, but you will eventually be able to save videos too. These can be posted directly to social media. -There is a wrist strap for both Joy-Cons that feel firm and snug and help push the L and R buttons out further. -At launch, there will be two different coloured sets of Joy-Cons: The standard Grey ones we've seen, and a Blue+Red combo. -First announced title is 1-2 Switch, which looks to be a reaction based game where you don't even look at the screen. Let's two people play. Available at launch. -Next new title is ARMS, a long reaching fighting game that uses the Joy-Cons as boxing gloves to hit far reaching opponents as if you were Mr. Fantastic. Comes out Spring. -Splatoon 2 officially revealed. Direct sequel. New and updated maps, brand new weapons (such as duel splatters), new super weapons, and more to be revealed. Comes out Summer. -Super Mario Odyssey revealed. Brand new 3D Mario adventure more like Super Mario 64 and Sunshine. Has Mario traversing strange new worlds and can use his cap to solve puzzles and reach out of reach areas. Comes out this Holiday season. -Xenoblade Chronicles 2, a direct sequel to the original Wii game, announced. Slated to arrive in Japan in 2017. -Fire Emblem Warriors also announced, though no date yet. We do get a glimpse of the Fire Emblem from Awakening and what appears to be Chrom in the teaser. -Dragon Quest X and XI both coming to the Switch, as well as both Dragon Quest Heroes titles. -A new Shin Megami Tensei game has been announced for Switch. -Project Octopath Traveller, a new RPG from the Bravely Default devs, announced. -Skyrim officially announced for Switch, coming this Fall. -A new game starring Travis Touchdown of No More Heroes fame is to be in development by Suda51. -FIFA is coming to Switch. Woo. 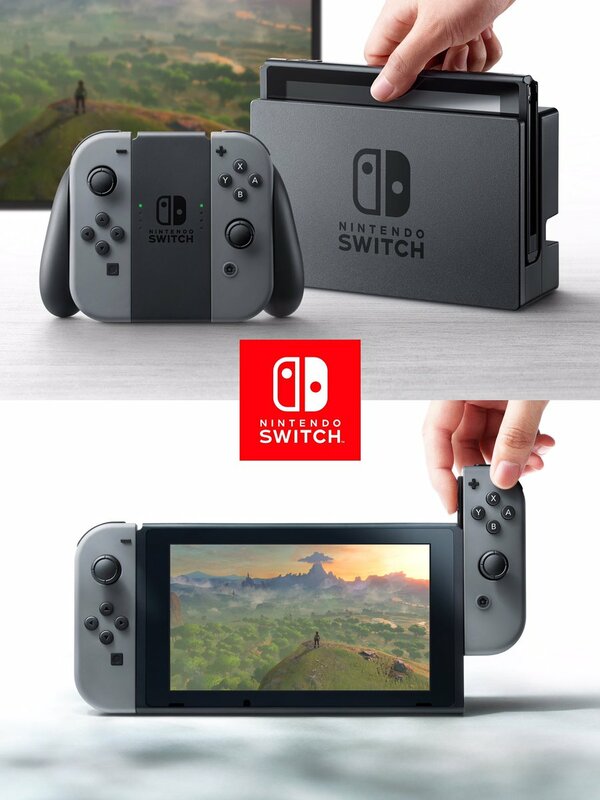 -Switch boxes come with the console, two Joy-Cons, Joy-Con Grip, the dock, an AC Adapter, and an HDMI Cable. The Pro Controller and USB-C cables sold separately. -Final Switch Trailer is for Zelda, which concludes by confirming that it is a launch title. It will also be on Wii U on the same day. -The console has 32GB of internal storage but can be expanded useing Micro SD cards. However, games are pretty beefy (Zelda alone takes about 14 GB). But it has been confirmed that it can support up to 256 GB Micro SD cards. -The paid online service is only required to play online. You don't need it for the share button or to go to the eShop or manage friends. However, having a subscription does give benefits, such as a monthly free VC game from NES or SNES and special discounts on the eShop. -Virtual Console games will actually have online multiplayer, shockingly enough. -Mario Kart 8 Deluxe is an updated version of the Wii U game, with 4 new characters (Inkling Girl/Boy, King Boo, Bowser Jr. Dry Bones) and an improved Battle Mode. -Arcade Archive is a small collection of NEO-GEO games, including King of Fighters '97 and Metal Slug 3. -Disgaea 5 Complete will arrive on the system not too long after launch. -Puyo Puyo Tetris will get an English release on the Switch for the very first time (as well as PS4). -I Am Setsuna will launch with the console. -Sonic Mania is, in fact, coming to Switch along with the new Sonic title coming later in 2017. -Bomberman is still alive with Super Bomberman R coming out at launch. -Ultra Street Fighter II: The Final Challengers will arrive onto Switch as well. I am mildly surprised, but pleasantly so, to learn that Splatoon is getting a sequel so soon. There's one game I want to buy. I didn't buy Mario Kart 8 for the Wii U, as I've learned to pace myself and get only every other release. This, however, looks like an ideal time to get the game, as it apparently has everything the original has and then some, including improving its only drawback (as far as ProJared was concerned, anyway) in the Battle Mode. There's another game I want to buy. I also didn't expect a sequel to Xenoblade Chronicles so soon. Only some time ago I was wondering how they would possibly name a direct sequel to the first game, since Xenoblade Chronicles X apparently takes place in a different universe (I still haven't played it; I'm saving it for sometime special), other than to just slap the number 2 onto it, and apparently that's what they're doing. It seems rather uninspired, but I don't know how they could take it any other direction. (I think they could have named X something other than Xenoblade Chronicles; maybe just "Xenoblade 'something different'" since it's not like there are any other games that use the Xenoblade name; that way, at least they could have named a direct sequel "Xenoblade Chronicles: 'something more creative' if necessary. 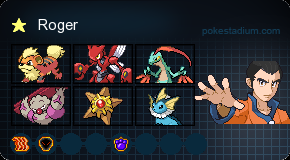 I dunno, I guess I'm nitpicking. Does the "X" in Xenoblade Chronicles X even mean anything?) On the subject of nitpicking, am I alone in disliking the artistic direction the series has taken starting with X? Everything seems to be getting more blatantly anime whereas the original had a nice, realistic style that set it apart from a lot of other games. Why couldn't a direct sequel keep that look? Fire Emblem Warriors sounds cool in concept. Here's hoping it will integrate more games than Tokyo Mirage Sessions did. I like how Super Mario Odyssey is a sandbox-type game like 64 and Sunshine. There's another game I want to buy. ARMS also seems cool. I don't know if I'll buy it yet, but I'll keep an eye on it. I wasn't sure how to feel about 1 2 Switch, but after hearing the explanation on it, it seems like a pretty neat idea for a party game. I may not buy it, though, due to how small my household is and how we never have friends over. I was surprised to see that Konami has actually shown interest in keeping Bomberman alive. I may buy Super Bomberman R (which would be my first Bomberman title) just to show my support. Oh yeah, and Breath of the Wild looks much more amazing now that we have characters shown off. I'll probably buy it for the Wii U, because a large part of me wants to hold off on buying the Switch in order to give Nintendo time to fine-tune it and release a better version down the line, as they tend to do. Plus, the Sheikah Slate in the game looks like it was made to integrate the GamePad, so why not run with that? Splatoon was a game I really wanted to like, but unfortunately, team based shooters, even ones with such a unique premise and goal, don't gel with me. With that said, the appeal for Splatoon was obvious so I am really not at all surprised at seeing a direct sequel, especially since it seems to already have much of the same framework as before. This version of Mario Kart 8 is certainly the definitive version, what with all the DLC and new stuff included. I am personally miffed about having it be $60 again, though Reggie did say to stay tuned for those who bought the Wii U version previously. I was also surprised to see another sequel to Xenoblade, but for a different reason. Since you haven't played X yet, without going into spoilers, the ending definitely left open a ton of questions that seemed to have implied there is still a story to be told, so the fact it isn't being continued in favour of what seems to be a direct sequel to the first game made me scratch my head. The supposed 2017 launch date is also shocking, since that is very quick after X (though the engine was supposedly done by 2014 for X, and they are reusing it). I almost wonder if maybe there were two teams working on two games with similar gameplay, with one wanting to continue what was after Shulk's adventure, and the other making something brand new. Heck, I wouldn't doubt X was under a different name before being called Xenoblade Chronicles X since there is very little that connects it with the original, outside of the battle system, the Nopon, and a Telethia. Fun facts: The Chronicles subtitle only exists in English. Japan just calls it Xenoblade. Additionally, it wasn't going to be called that either, instead being known as Monado: Beginning of the World, seemingly without any sort of link to the previous Xeno-games at all. Just some food for thought. As for the X itself, it doesn't actually mean anything specific, aside from the main character's default name (pronounced Cross). As an aside, character design is easily Monolith's worst part, though in fairness, I still prefer them over the seemingly living doll design we got in X.
TMS barely even looked like it had Fire Emblem at all, but I digress. My chief concern right now about Warriors is pretty much what you mentioned: Representation. There are enough characters in a single Fire Emblem to fill an entire musou game, so I am a little concerned this may be another Awakening self love. C'mon, I want some Path of Radiance in there! Said all I wanted about Mario. Good to see this style again. 1/2 Switch is a neat concept, but I really don't want to pay full price for a game you don't even look at, especially a local multiplayer focused one. Maybe if it gets heavily discounted, I'll look into it. This is their "look at the stuff you can do" game like past launch titles were, though not bundled for some reason. Konami making a new game, period, is shocking enough! Supposedly, it was made by some former Hudson employees. As an aside, seeing the game in action...doesn't look very good. Who's bright idea was it to have a Bomberman game at 30 FPS? 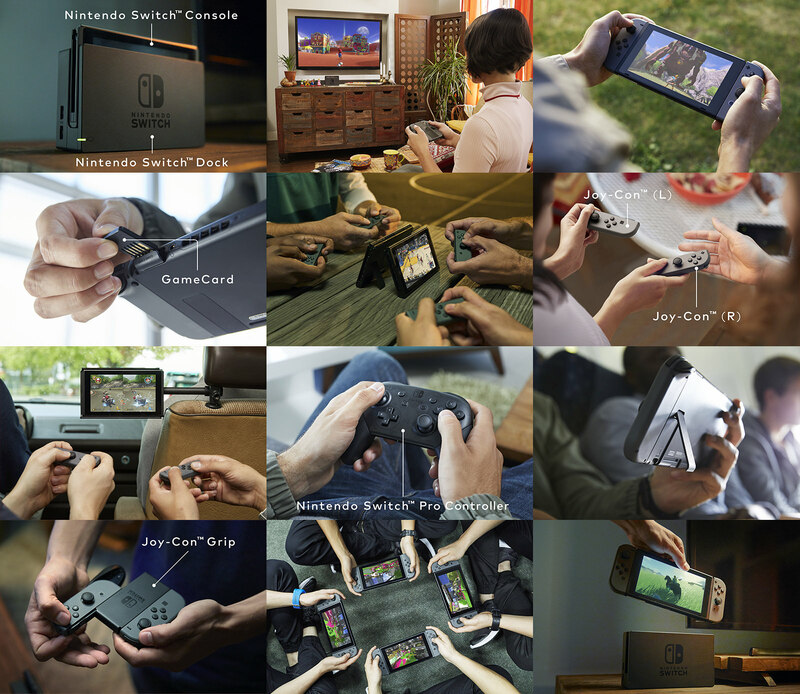 Although 8 player local is really sweet if you are willing to get enough Joy-Cons (Switch units can support up to 8 players on one unit.). And the more I see of Zelda, the more I can't wait for it. Thankfully, that isn't very long, whether you want the Switch or Wii U version. Just 7 weeks to go. Splatoon sequel should be interesting...but I wonder what else they'll add to it, maybe anything for single player? I was hoping we would be getting a Mario Kart sequel for the Switch instead of 8, but that's...something. Shame since I bought the first set of DLC once since I didn't think Nintendo would ever make a GOTY edition or something like this. I still haven't finished Xenoblade yet but I'm interested to see a sequel. But not even 2 years after X? Wow, even if they are using the engine from X...interesting. I saw some TMS footage and I wondered why it had so little FE at all, then again they denoted FE to a hashtag in the title anyway. It had a lot of weird choices overall and that's not even getting into the censorship. But FE Warriors...not surprised it's coming out, but I'm pretty interested and have some faith considering Koei's been doing great with Musous featuring other franchises. I do agree with B, I'm hoping it doesn't just focus on Awakening and even Fates, give some of the older games love. Give me Ike Aethering Grima and you have me sold. Super Mario Odyssey, featuring Mario going to BROOKLYN?! Maybe it isn't Brooklyn but a Mario game in a modern day setting...is kind of surreal. It sure does look good though and with the open ended style coming back. I wouldn't mind seeing a 3D Land/World game again, though that seems better for handhelds. Lol new Konami game...with Bomberman? Interesting. Breath of the Wild should still be great, I still expect it to be so. How great remains to be seen though but I really do believe in it. I'm wondering if there's anything else they may reveal, probably nothing too big but anything like what some amiibo may do. Also that fiasco Nintendo had with the Master Edition pisses me off though, putting it up at 3 AM...and really making it extremely limited. Here's hoping we get more for single player Splatoon. The single player was actually pretty great on the first game, complete with some nice world building via Sunken Scrolls (who knew Splatoon took place in a post-apocalyptic world because humans ignored the warnings about climate change?). That said, the meat and potatoes will be its multi player, and unless the deets about Nintendo's online are actually very positive, I"m not about to jump in there, even if I was interested in shooting again. I was also hoping for a new Mario Kart as opposed to Deluxe. And this literally only adds new Battle Mode stuff and characters. Unless there is some compensation for Wii U owners, I'm passing on this one. Y'know, I don't recall seeing very much Shin Megami Tensei in TMS either, outside of the game feeling very Persona-ish. That said, there is a Fire Emblem Direct on the 18th that might tell us a little more about this Warriors title, though it'll probably mainly focus on the upcoming mobile game they've been working on. For the record, the modern city world Mario explores is called New Donk City. That isn't just a funny name; There are Donkey Kong references everywhere! Diddy has a shop, there are streets named after Dixie, Cranky, and even K. Rool! It's even weirder than I initially thought! Yeah I was very pleased with Splatoon's single player. A lot of fun, creativity and general lore...and that OST! I never really played multiplayer either, but I got it for so cheap I was ok with just the single player. I do need to play it in depth or more often. I thought Deluxe was a new Mario Kart at first...honestly with it and Breath of the Wild, it sort of gives me a bad taste about the Switch's future with remasters/ports of old Wii U games. I was worried Splatoon 2 was also just the first game too. Wait TMS wasn't that SMT like? I saw the Persona vibes, odd since it was meant to be SMT, pretty obviously but didn't know it lacked SMT. I feel like TMS had a really troubled development. I dunno. That Fire Emblem direct should be interesting though apparently FE Fates Revelations might come to switch...interesting. New Donk City has all those DK references? I like that. A lot. Reminds me of Dead Rising's RE references. Though I do wonder about getting a DKC game on the Switch. Literally the only two games I cared enough about to preorder the switch have been announced. That new Zelda thing, and a "new" tetris, under Puyo puyo tetris. Splatoon 2 was just a nice little bonus for me. Now if only we could get some more preorder spots. Amazon, Gamestop, come on Nintendo. That !#%$ was out of stock before I had time to finish blinking. It literally went up the moment after it was announced...at like 3 AM. Because Nintendo still doesn't know jack about supply and demand! And here I thought they were starting to learn from their mistakes. Sigh. So a Nintendo Direct was released three days ago. In B-Man's absence, I'll try to summarize everything we learned. Pikmin 3DS now has an official name: Hey! Pikmin. The story features Captain Olimar aboard the S.S. Dolphin 2 (so we're not going to see the original Dolphin again? Boo...) as he crash-lands on a new planet coincidentally teeming with Pikmin, Bulborbs, and a bunch of new creatures. It's a side-scrolling platformer where the objective is to collect seeds and treasures that refuel his ship. Release date is July 28. I owe it to my name to pick up a copy. Also, new Pikmin amiibo to be released on the same date. Ever Oasis got some more exposure. Supposedly the player's objective is to protect the world's last oasis, which houses a mermaid-like spirit named Esna, who supports the player both physically and emotionally. Sounds like waifu material to me. Release date is June 23. Monster Hunter Stories, a new spin-off from the Monster Hunter series, is coming to 3DS this fall. In a very Pokémon-like move, the two versions of Yo-kai Watch 2 are getting a third version added to the shelves this fall: Psychic Specters. The card/board game Culdcept is getting an iteration on the 3DS on August 29 called Culdcept Revolt. Honestly, I only know of this series because of the single music track that exists in Smash Bros.
RPG Maker Fes hits the stores June 27. Despite allowing you to fully customize your own RPG adventure, it seems to be heavily rooted in the Disgaea series. Miitopia is getting a western release later this year! See shenanigans ensue as a team of your Miis go on an RPG quest to save the world while bonding or resenting each other, leading to interesting results on the battlefield! The remake of Fire Emblem Gaiden known as Fire Emblem: Shadows of Valentia will include DLC. 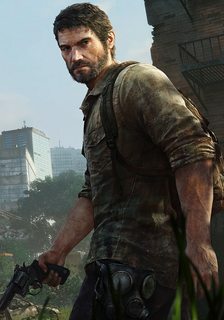 This DLC can include more maps, dungeons, and opportunities to learn more about the reportedly personality-dry cast from the original game. A Season Pass can be used to access all of the DLC as it's released as opposed to purchasing it in packs, but details are still forthcoming about how to get a Season Pass. To celebrate Kirby's 25th Anniversary, three new games are on their way! The first, Team Kirby Clash Deluxe, appears to be an expansion of Team Kirby Clash from Kirby Planet Robobot, and is available right now on eShop! The second, Kirby's Blowout Blast, is likewise an expansion of Kirby 3D Rumble from Planet Robobot, and will be arriving on the eShop this summer. And lastly, there's a multiplayer action game (no title given) slated for release for the holiday. BYE-BYE BOXBOY!, the final game of the BOXBOY! trilogy, is available now! You can also try demos for all three games in the eShop. More amiibo: Three Links, one from Majora's Mask, Twilight Princess, and Skyward Sword, will be available June 23. In addition, amiibo for Cloud, Corrin, and Bayonetta will be available July 21, each one having two possible figures. ARMS was featured, led by a cartoon commentator called Biff. The variety of arms was briefly showcased, along with a mode called the Get Arms service that allows players to rack up in-game currency to buy more arms. But most importantly, a new character was introduced! Called Minmin, she's a ramen-themed fighter who has the ability to kick away punches in midair, and she can transform her left arm into a dragon to fire a laser! Also introduced were 2-on-2 matches, along with a release date of June 16. A new color of Joy-Cons and Joy-Con Straps, Neon Yellow, will be released on June 16. Also being released on this date is a AA Battery Pack for the Joy-Cons. Mario Kart 8 Deluxe was shown again, particularly advertising the multiplayer and online modes. The launch date is April 28. Ultra Street Fighter II: The Final Challengers is coming to Switch on May 26, introducing Evil Ryu and Violent Ken as new characters, a new Way of the Hado mode which allows the player to make the motions of the Hadoken to fire one in a first-person perspective, 2-player co-op battles, and a touch-screen mode that allows players to launch special moves with just a finger input. Minecraft: Nintendo Switch Edition is to make its way to the eShop on May 11 and to stores at a later date. Includes the Super Mario Mashup Pack. NEOGEO Arcade Archives is bringing NEOGEO classics to the Switch, with one already available: Samurai Showdown IV Amakusa's Revenge. Sonic Forces and Sonic Mania were shown again, this time with Green Hill Zone and an unknown new ally teased for Forces, and the promise of updated old stages for Mania in addition to new ones. Forces is scheduled for release on the holiday, and Mania should be available this summer. Project Mekuru (working title) is a multiplayer title where players try to ground-pound a board to flip the floor panels to their color. Flipping panels can knock away opponents and reveal power-ups. The key to winning is to have the most panels in your color by the end of the game. Scheduled for release this summer. Fate/Extella, an action game featuring an all-star cast from the series, will launch on July 25. Disgaea 5 Complete will be available May 23. A demo for Puyo Puyo Tetris is available now! Monopoly is coming to the Switch this fall. It allows up to 6 players and takes advantage of HD Rumble. Ever the console-jumper, Rayman Legends: Definitive Edition is coming to the Switch later this year. Includes Mario and Luigi costumes for Rayman and Globox. Two games by THQ Nordic, Sine Mora EX, a shoot-'em-up, and Battle Chasers: Nightwar, a dungeon-crawling RPG, will be available this summer. Payday 2 is coming to the Switch later this year. NAMCO MUSEUM, a game containing all the classics you'd expect and then some, launches this summer. A limited supply of Nintendo Switch Docks will be sold separately starting May 19. The U.S. Inkling Open I brought up in the Chat thread was formally announced. Teams of 4 players (with one backup allowed) will duke it out in qualifying rounds April 22, with only 16 teams contending for the big prizes of a free trip to E3, Nintendo Switches, copies of Splatoon 2, and more at the final rounds on April 29. A new mode for Splatoon 2 was showcased: Salmon Run, where 4 players work together to fight off hordes of new enemies called Salmonids to win Power Eggs and Golden Eggs, which will be used to acquire certain rewards. Downed teammates can be revived by shooting the life preserver they leave behind. Also showcased was amiibo compatibility, featuring a new lineup of Inkling Girl, Inkling Boy, and Inkling Squid. The figures will have the ability to store gear data for your Inkling, as well as give you unique gear. Previous amiibo will also be utilized, though their exact functions are unknown as of now. The official release date for Splatoon 2 and its new amiibo is June 21.